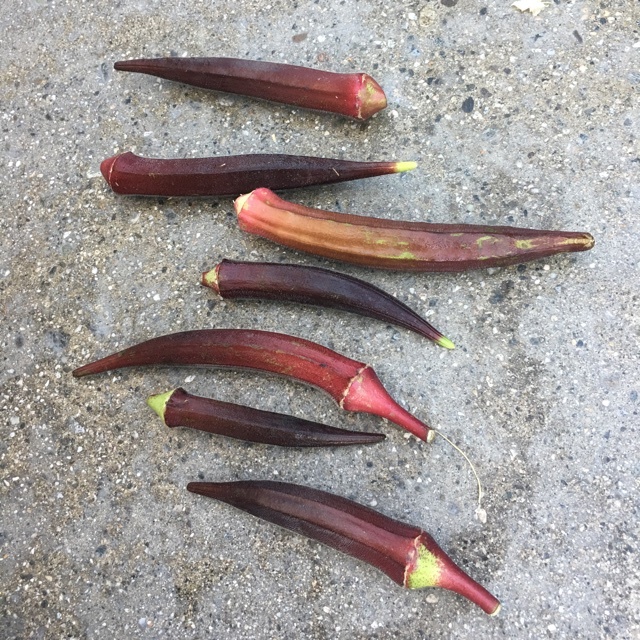 Red okra are torpedo shaped and two to five inches long. Offering a unique flavor and texture, the fresh taste is somewhere between eggplant and asparagus. When cooked, however, the red color disappears and the pods turn green. 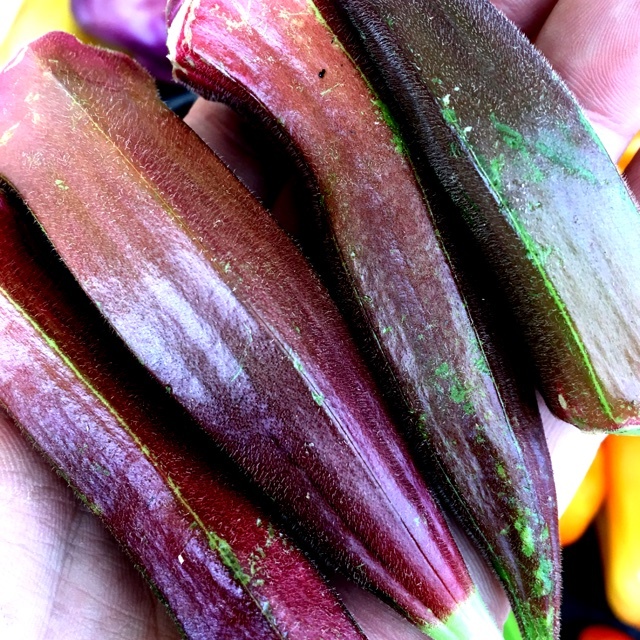 Raw red okra adds a colorful touch. 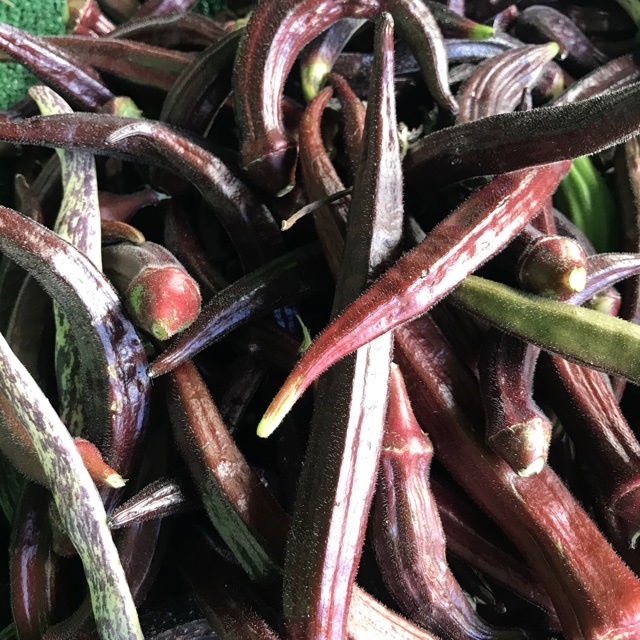 Red okra are available in summer. Okra provides a good source of vitamin C, vitamin A, folacin and other B vitamins plus magnesium, potassium and calcium. It is fat-free, saturated-fat-free, cholesterol-free and low in calories. A substantial source of dietary fiber, okra provides over five grams per three and one-half ounce serving. The extra folate supplied by this vegetable is beneficial to pregnant women. 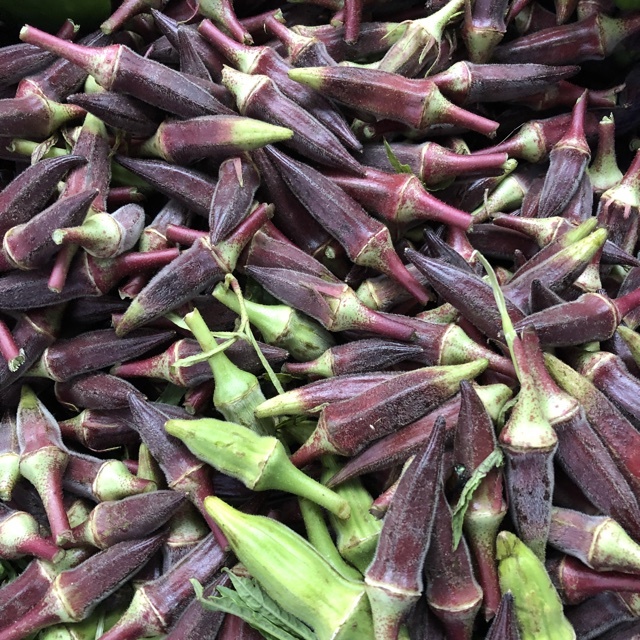 Okra may be microwaved, blanched, boiled, steamed, deep-fried, braised or sautéed. Blending well with a variety of vegetables, tomatoes, corn and peppers are favorite medley partners. Do not wash until ready to prepare as water causes pods to become slimy. Do not cook in aluminum or cast iron as okra will turn dark. 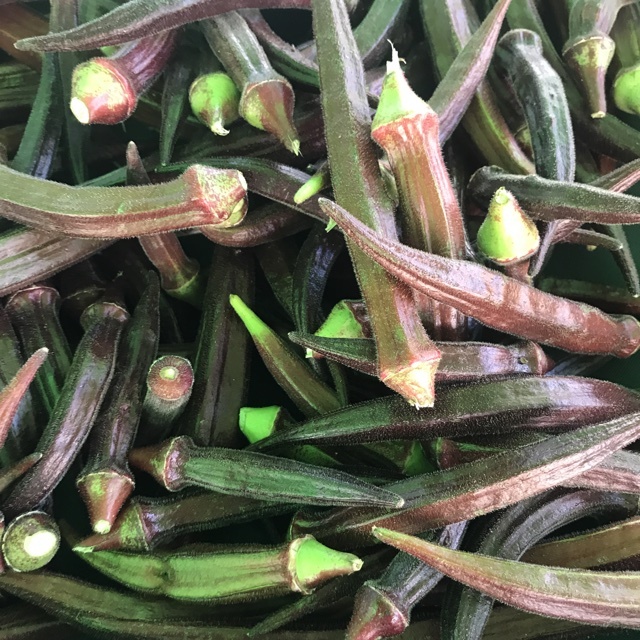 Okra is especially popular in Egypt, Morocco, India, Africa, the Caribbean, South America, the Middle East and in the southern United States. Okra has made a recent transition from being an "ethnic food" to becoming a chic vegetable.  This has resulted from the American restaurant boom and an increased interest in regional foods. 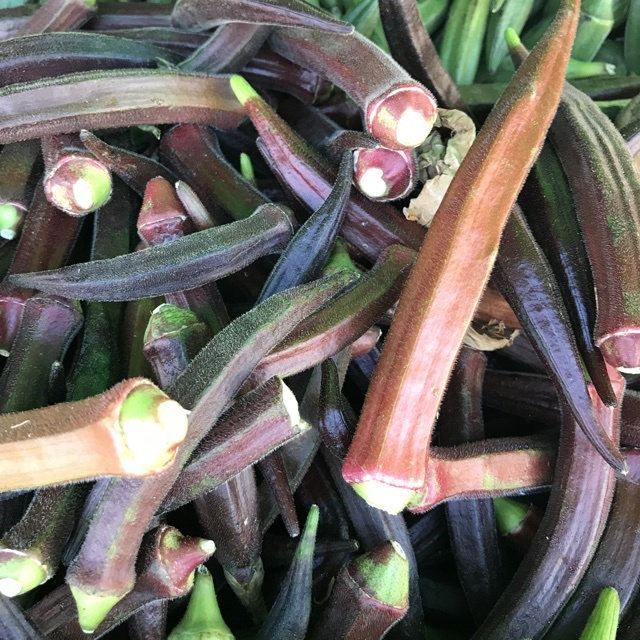 Native to Africa, okra is a member of the Malvaceae or mallow family that includes hollyhock, cotton, rose of Sharon and hibiscus. 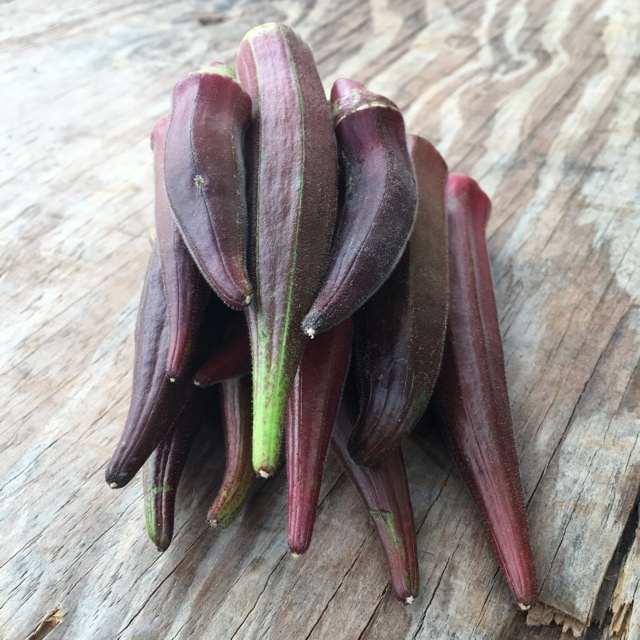 Red or burgundy okra is a relatively new variety. 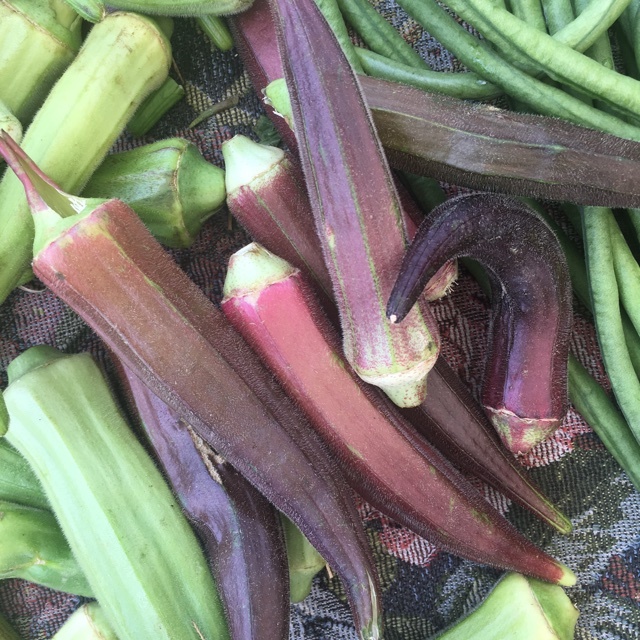 In varying shades of color, okra may be chunky or slender and have ribbed or smooth surfaces. Growing tall, this annual vegetable plant produces large attractive hibiscus-like flowers and lobed heart-shaped usually hairy leaves with long stems attached to a thick woody stem. The pods develop in the leaf axil and grow rapidly after flowering. 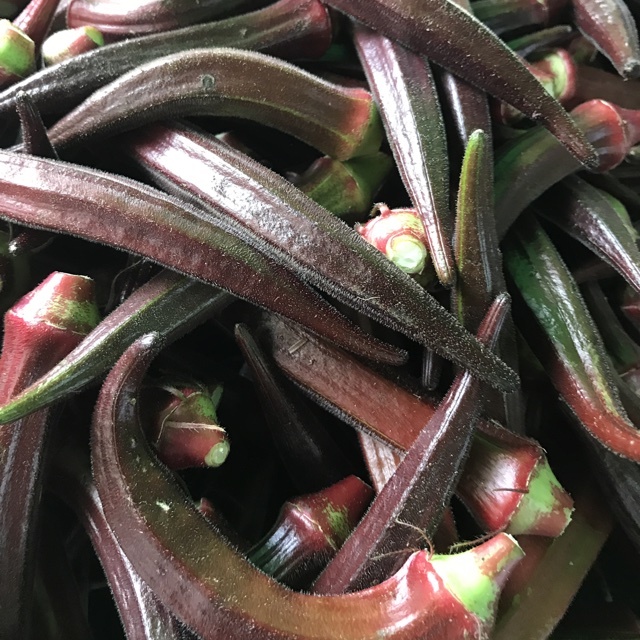 Recipes that include Red Okra. One is easiest, three is harder. 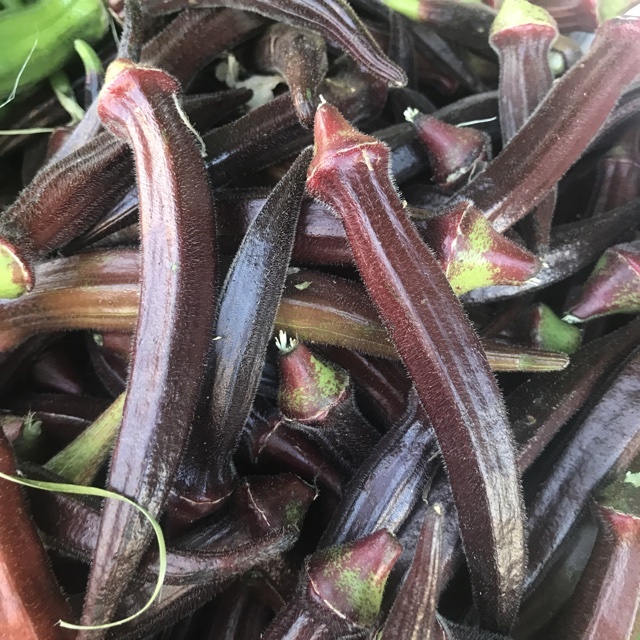 People have shared Red Okra using the Specialty Produce app for iPhone and Android. 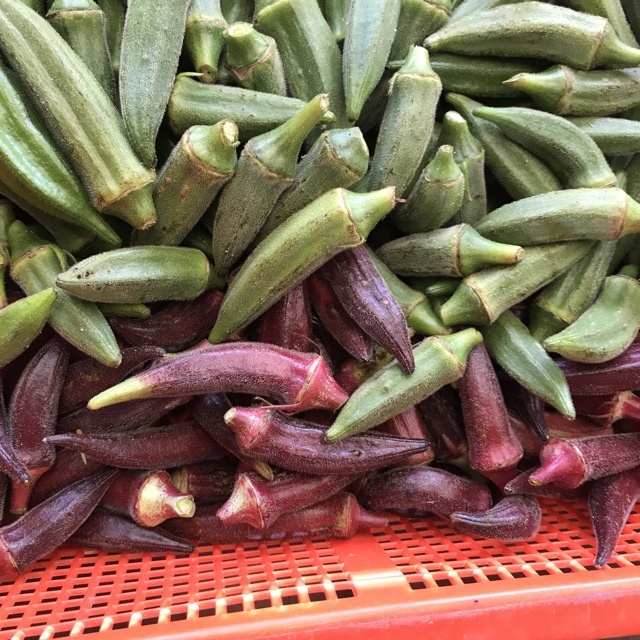 Sharer's comments : Red Okra spotted at Little Italy Mercato. 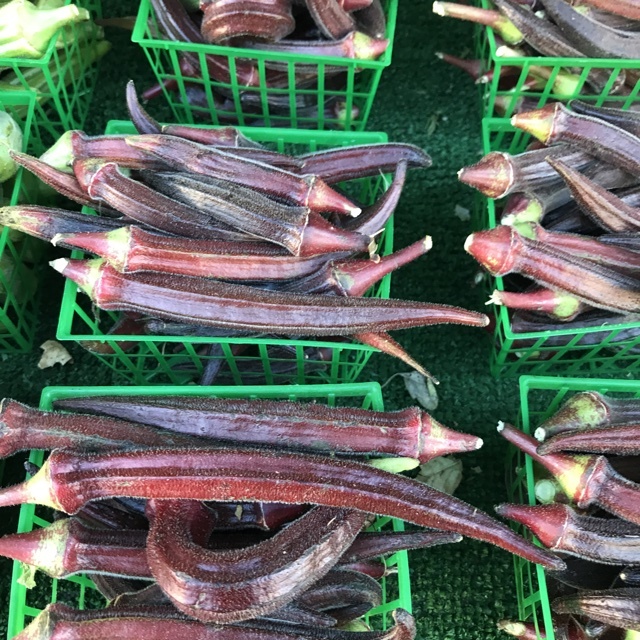 Sharer's comments : Red Okra spotted at Vista Farmers Market. 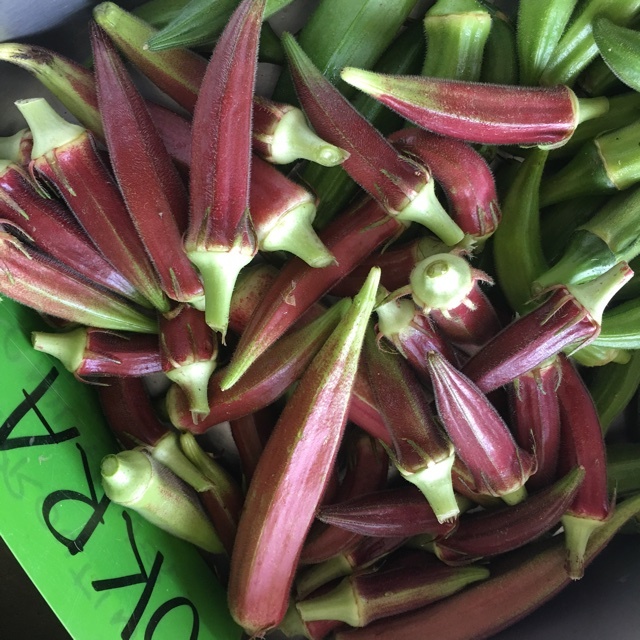 Sharer's comments : Red Okra spotted at Hillcrest Farmers Market. 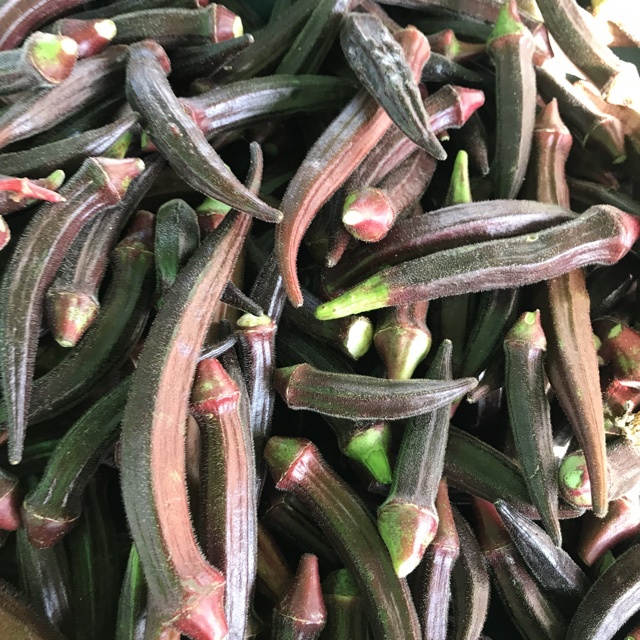 Sharer's comments : Red Okra spotted at Chino's Vegetable Shop. 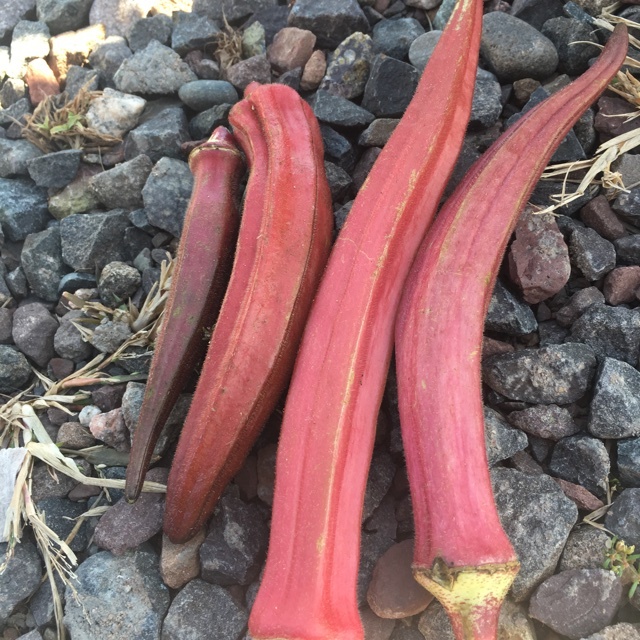 Sharer's comments : Red Okra spotted at Hayward Wisconsin Farmers Market. Royal Burgundy variety. 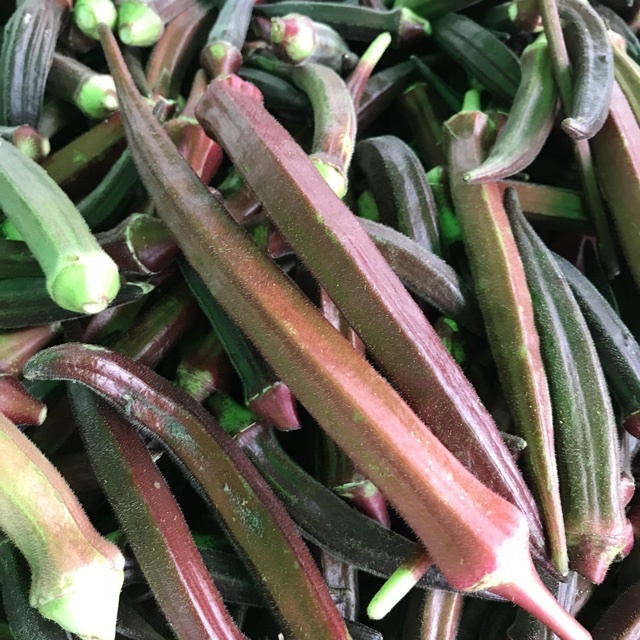 Sharer's comments : Red Okra spotted at Virginia Park Farmer's Market. 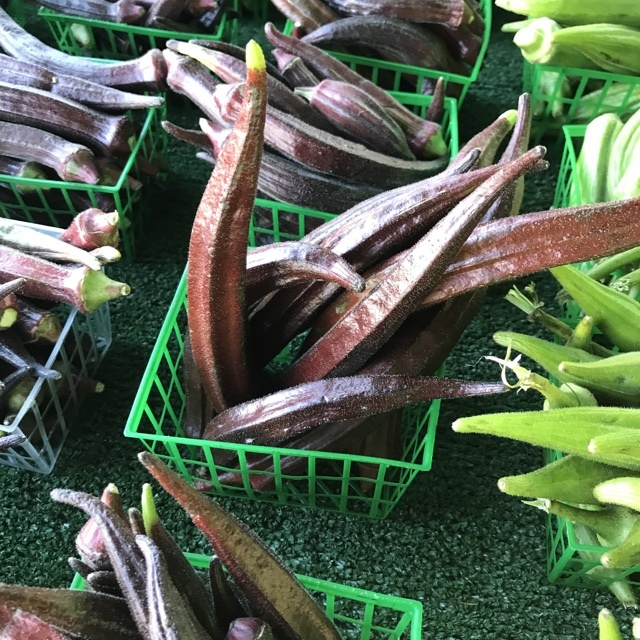 Sharer's comments : Red Okra spotted at Santa Monica Farmers Market.